“Our Hemisphere”: On That Pro-Columbus Editorial in the WSJ. Last week the Wall Street Journal ran a troubling editorial by Alejandro Bermudez, the executive director of ACI Prensa, a Spanish-language Catholic news service. Our hemisphere, he writes. Setting up a straw man, Bermudez argues that “the notion that indigenous life was perfect and Western culture the locus of all evil is as absurd as white supremacy.” Which is literally why no respectable historian has ever made that argument. Certainly not that extension of the crusades that destroyed millions of lives on a global scale. But Bermudez does not care about native peoples or the catastrophic consequences of colonialism. He is worried that great white men and their historical legacy are under assault. Whatever they did, it was no worse than the savages whose lands they took, whose souls they saved, whose bodies they enslaved. I find arguments like these exhausting. Let’s be clear: The Columbian Encounter, so-called, is the beginning of a horror story for the native peoples of the Americas, North, South, and Central, as well as the indigenous population of the Caribbean, who were quickly destroyed as autonomous peoples by the Spanish newcomers. Columbus, his supporters might argue, gets too much of the blame. He did nothing to native peoples in North America because he never set foot on the North American continent. This much is true, but Columbus has become, and perhaps always has been, a symbol standing in for the “fundamental violence of discovery,” as I class it in the second chapter of Native America. The sort of sentiments expressed by Bermudez are nothing new, of course. Back in 2017, for instance, a long-time conservative radio personality in Rochester tweeted out that “other than the birth, death, & resurrection of Jesus, the discovery of the Americas by Columbus was the most important event in human history.” There are a lot of obvious problems with this argument, but this sort of sentiment has been widely embraced on the political right. Matt Walsh, a columnist for The Blaze who tweets @MattWalshBlog, told his many followers to not “let anyone tell you it’s wrong to celebrate the great men who built our civilization.” Kurt Schlichter, another pundit aggressively active on Twitter, said that “the European conquest of the Americas was history’s greatest achievement.” You may remember the controversy from two years ago when the Daily Wire posted an incredibly racist and offensive video, since removed from their site with apologies from the editor, depicting the Americas in 1491 as a land of savagery, cannibalism, and superstition that was refined and civilized by Christopher Columbus. The opinion piece by Bermudez echoes all of this. Not one mention of native peoples. We are witnessing a reaction against the very notion that native peoples have a place in this American story that is worth remembering and retelling. 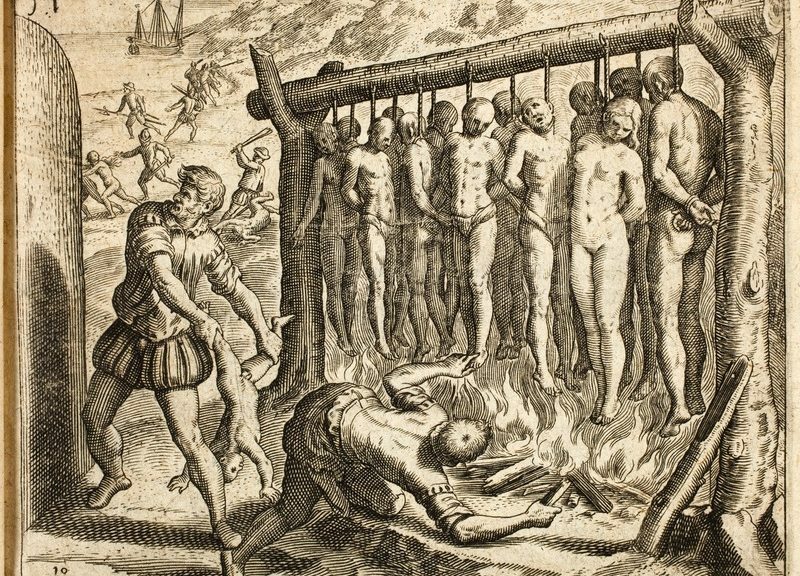 Their suffering, their destruction, the rapacity of European colonization–it all is the price the people of “Our Hemisphere” have paid for civility and Christianity. The comments in the WSJ by Bermudez are outrageous. His argument doesn’t surprise me, but certainly reflects his ignorance of history. The Catholic Church has been responsible for many abhorrent actions throughout history, all in the name their god. Recent revelations about extensive sexual abuse, long ignored or covered up, reinforce the reality of the church’s dark and ugly past, especially as it relates to native peoples.